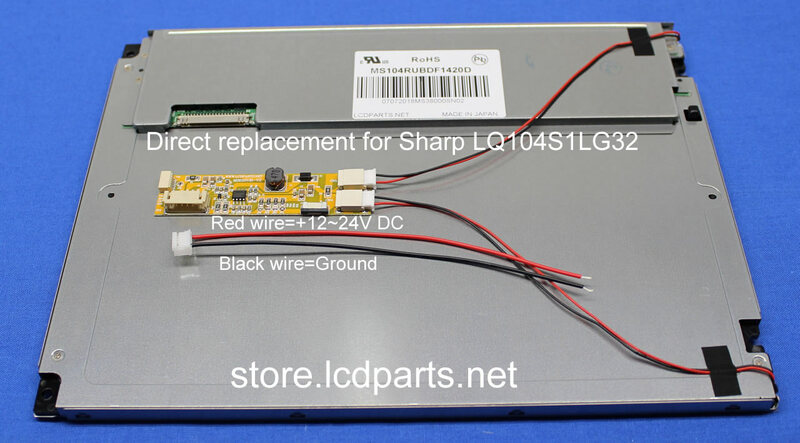 This new MS104 RUBDF1420D1 is upgraded LCD screen for Sharp LQ104S1LG32. With our proprietary LED kit installed. Simply swap out your defective Sharp LQ104S1LG32, you now have a sunlight readable HMI Monitor. It is easy to install! No technical skills required! Anyone can do it! To fire up LED backlight strip, all you need to do it apply +12V (+12V to + 24V DC) to Red wires and Negative (Ground) to Black wires on MS610UB. That’s it. It is easy to install! No technical skills require! Anyone can do it! MS104RUBDF1420D1 has the same interface connector, dimension and screw hole as the LCD screens that listed below.